Life was hard in the Days of the Tsar. Click here to play! Many people toiled under pitiless lords with little concern for the lives of peasants. This meant short, brutal lives for the vast majority, but it fueled the decadent excesses of the Tsars and Tsarinas. Elaborate clothing, self-serving statues and the iconic Faberge Eggs were all a part of the luxurious lives that these fortunate few got to live at the expense of their serfs. In the Days of the Tsar slots, you too can live like an iron-fisted Tsar, and maybe even make the kind of fortunes that made their sophisticated lifestyle possible. Of course, a happy difference is that you will not have to rely on the suffering on the masses to earn your money - just a decent wager and a lot of luck! Marvel at the exquisite majesty that service under the Tsars was able to produce in terms of architecture and the intricate design of Faberge Eggs. Stand up to the Tsar and his beautiful Tsarina. 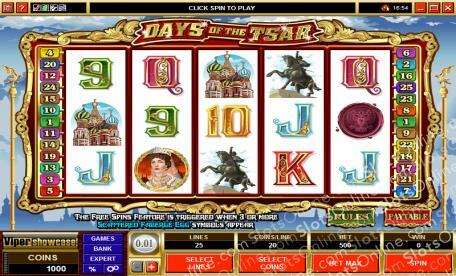 Try your luck and become a hero of the people, all in the Days of the Tsar slots. The Faberge Egg symbols are scatter symbols that payout on the total bet and trigger free spins. 2 symbols pay twice the total bet, 3 pay 5 times the bet, 4 pay 20 times the bet, and 5 symbols pay 100 times the total bet. When 3 or more land on the reels, they also trigger free spins. Each symbol reveals a number, and the sum of these numbers is the number of free spins awarded. An extra free spin is awarded every time another Faberge Egg lands on the reels during the free spins. The Tsar symbol is wild and substitutes for all symbols other than scatter symbols.